You should be automatically redirected. If not, visit http://www.swearimnotpaul.com and update your bookmarks. Irish music blog. Containing gig, live and concert reviews reviews; album reviews; setlists for recent Dublin shows; album news; and basically everything from the Irish music scene. 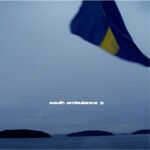 Sweden's South Ambulance have just released EP#5, which is available on Indiecater Records for the cheap-cheap (like the bird) price of €2.50. How could you pass up an offer like that? If you don't know them, I've an mp3 of one of the tracks from the record, 'Dear Mutiny' to download. And while we're talking of Mutinies, has anyone read John Boyne's novel Mutiny on the Bounty or the new one that's in the charts at the moment? I'm wondering are they worth getting.